RISC-V is a new ISA (Instruction Set Architecture) that introduces high level of flexibility into processor architecture design, and enables processor implementations tailored for applications in a variety of domains, from embedded systems, IoT, and high-end mobile phones to warehouse-scale cloud computers. The downside of this extent of flexibility is the verification effort that must be devoted to all variants of the RISC-V cores. In this article, Codasip and Mentor aim to describe their methodology of effective verification of RISC-V processors, based on a combination of standard techniques, such as UVM and emulation, and new concepts that focus on the specifics of the RISC-V verification, such as configura- tion layer, golden predictor model, and FlexMem approach. Considering the possible number of RISC-V core variants, it is not practical to manually implement and maintain all corresponding RTL representations and UVM environments. Automation is advisable, its type depending on the configuration variability of RISC-V cores. This article will present three options. “I”, “M”, and “C” stand for standard RISC-V instruction extensions as defined in Section I, “p” signifies enabled hardware parallel multiplier, and “d” enabled JTAG debugging. The difference between the presence and absence of the multiplication and division extension (“M”) in the Bk processor configuration practically only consists in the number of supported instructions. From the RTL and UVM point of view, this means that the existing RTL modules are longer, and the instruction decoder is more complicated. However, when the compressed instructions extension (“C”) is enabled, many new logic blocks are added to the RTL together with a new dedicated instructions decoder. This requires compiling additional RTL files that will describe these new logic blocks. 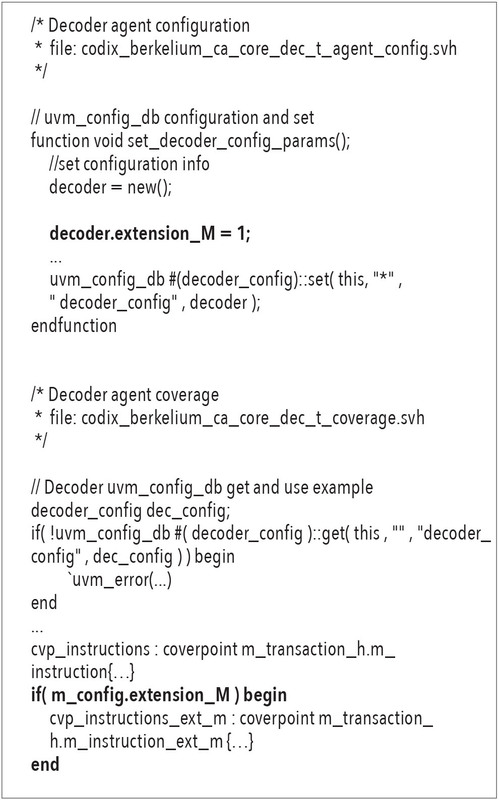 From the UVM point of view, a new UVM agent for the compressed instructions decoder needs to be compiled and properly connected to the rest of the UVM environment. 1. The first option is to place the configuration layer at the beginning of the automation flow. Codasip does so by inserting the configuration string into the high-level CodAL description; see an example of a GUI configuration entry in Codasip Studio (the processor development environment) in Fig. 2. As you can see, the configuration text string consists of three parts divided by dashes. The first part specifies the name of the processor and the number of pipeline stages. The second part contains the used ISA extensions, and the last part specifies optional hardware extensions. a. bk3-32IM-pd: When considering bk3-32IM-pd configuration string in Codasip Studio (Fig. 2), the defined processor model will have three pipeline stages and 32-bit word-width support. It will con- tain base integer instructions (“I”), instructions for multiplication and division (“M”), and it will have two hardware extensions – parallel multiplier (“p”) and JTAG debug interface (“d”). Other settings, such as memory size or caches enabled, can be found in the options table. Once the configuration is complete, it is possible to automatically generate RTL and UVM for this specific configuration with a single click. 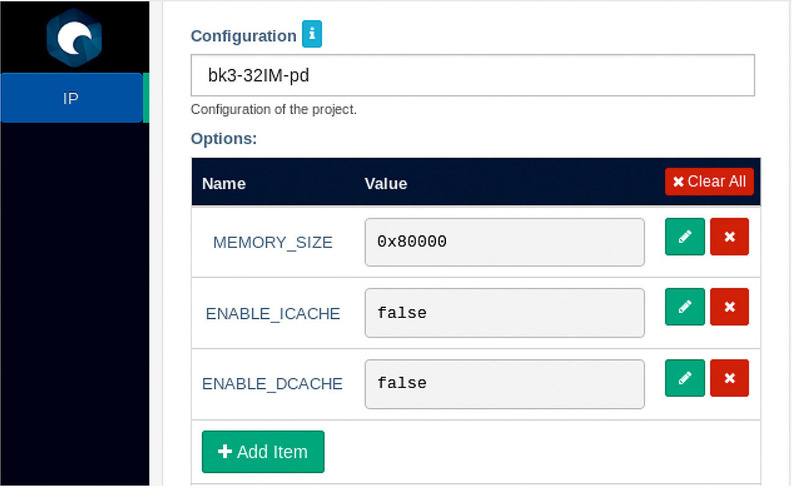 b. bk3-32IMC-pd: When using the configuration layer in Codasip Studio, no overhead is created by enabling the compressed instructions extension (“C”) in the bk3-32IMC-pd configuration (Fig. 3). 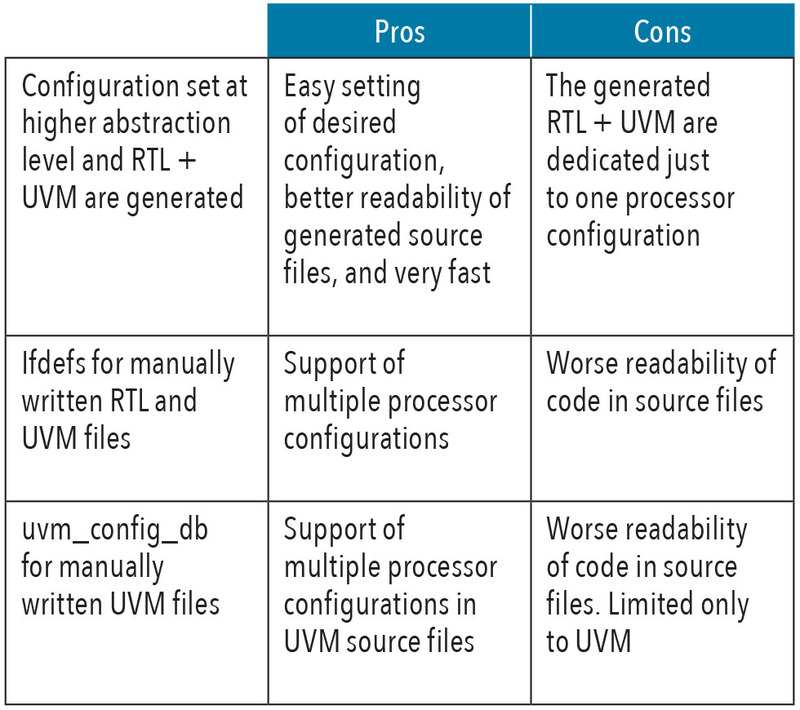 The only action needed is rebuilding of the RTL and UVM environments so that they reflect the change in configuration. 2. The second option, suitable for manually written RTLs and verification environments, is to implement RTL and UVM that can be configured by ifdef constructs and related scripts. With this method, only one RTL and one verification environment for multiple RISC-V core variants are needed. a. bk3-32IM-pd: To compile the source files, we use the compiler define options that are common for RTL and UVM, as seen in Fig. 4. Code snippets in Example 1 show that the configurable extensions are enclosed in their specific define parts. For example, “M” instructions are enclosed in `ifdef	EXTENSION_M in the decoder.svh file. Only when this file is compiled with +define+EXTENSION_M, the “M” instructions will be recognized by the decoder. The same applies to the part of the example related to coverage. Thus, the principle of this method allows for configuring the UVM environment during compilation before each individual verification run. Furthermore, it makes for easier extending of the UVM environment with new ISA or hardware extensions. b. bk3-32IMC-pd: When adding the “C” extension, it is vital to ensure that an additional agent for the compressed instructions decoder will be compiled and connected. As shown in Example 2, `ifdef EXTENSION_C allows compiling the agent package which contains all agent files for compressed instructions decoder in compile.tcl file, binding the agent to the RTL signals of the processor in dut.sv file and registering it into the UVM configuration database in the UVM environment env.sv file. 3. The third option is to use the standard means of UVM for configuration (uvm_config_db, see ). This option is similar to using ifdef (second option presented in this article), but it is limited to the UVM environment. a. bk3-32IM-pd: As indicated by the code snippet in Example 3, enabling of the “M” instruction extension is reflected by the extension_M parameter which is saved into the UVM configuration database. It is then possible to obtain its value by calling the get function from a specific part of the UVM environment (the coverage file, for example), and then use it for creating new objects. b. bk3-32IMC-pd: When we applied the uvm_config_db procedure to the configuration with “C” extension enabled, we encountered difficulties with connecting the additional agent and compiling the source files. That tells us that this method is suitable for ISA or hardware extensions that extend the functions of the processor without additional logic files that need to be compiled and connected. For the comparison of all above-mentioned configuration methods, we summarized the main advantages and disadvantages in Table 1, "Advantages and Disadvantages of the Configuration Methods"
An ISA simulator, or an instruction simulator, is used to execute the instruction stream. High performance is achieved by omitting micro-architectural implementation details. The simulator is usually implemented in C/C++/SystemC, and represents the reference functionality . Codasip generates an ISA simulator from the high-level instruction-accurate CodAL model as part of their automation flow. The ISA simulator is also used as a golden predictor model in UVM verification, meaning that the RTL processor model (DUV) generated from the high-level cycle-accurate CodAL model is verified against it. There are some obstacles to this approach, such as the asynchronous nature of the C++ ISA model (RTL is cycle-accurate), resolved by memory loaders that can load a program to the program memory consistently in RTL and C++ – after that, both are running on their own speed. Result comparison is handled by buffering the outputs of the faster component: when data is present in both the golden predictor model FIFO and the DUV FIFO in Scoreboard, comparison is executed. In the Codasip automation flow, assembling the UVM verification environment including the golden predictor model is much faster than in the standard flow, when all components are written manually. Time savings on the verification work are counted in man-months. Getting a viable golden predictor model is, however, only the first step. The second important criterion is simulation runtime. Flexibility of the RISC-V ISA allows for implementing tens of viable processor RISC-V micro-architectures. For example, at Codasip we are currently working with 48 variants of RISC-V. Considering that each of these micro-architecture is verified by at least 10,000 programs of around 500 instructions (C-programs, benchmarks, randomly generated assembler programs), the verification runtime is enormous. To handle the effort, we di- vided the verification runtime into phases. In the first phase, we run suitable program representatives in RTL simulation, benefiting from very good debugging capabilities of the simulator. In the second phase, after debugging, we run the rest of the programs (mainly random ones) in the emulation environment. The main drawback of RTL simulation is the inability to perform tasks in parallel. A good solution is to use emulation and exploit inherent parallelism in real hardware environment. Many papers and books have already been published that present the possible runtime improvements, for example ; our goal in this article is to show how verification of the RISC-V processors in particular can benefit from the emulation environment. Our path of porting quite complex UVM environment for Berkelium processors to the Veloce® emulator  was not straightforward; based on our experience, we defined the following recommendations. 1. We started by comparing pure simulation and pure emulation environment runtimes. This means that we measured time of loading a specific program to the program part of the memory and the runtime of evaluating this program on the RISC-V Berkelium processor in UVM in Questa® RTL simulator, and the runtime of evaluating the same program on the Berkelium processor located on the emulator. In this case, we used a very simple emulator top-level module which instantiates the Berkelium processor. At the beginning, the program is loaded, and by deactivating the processor’s RESET signal it starts processing the program. A simple comparison of this type clearly indicates the maximum emulation performance for a specific DUV, as no software counterparts are slowing it down. In addition, it is also possible to estimate the benefits of using the emulator for a specific project. 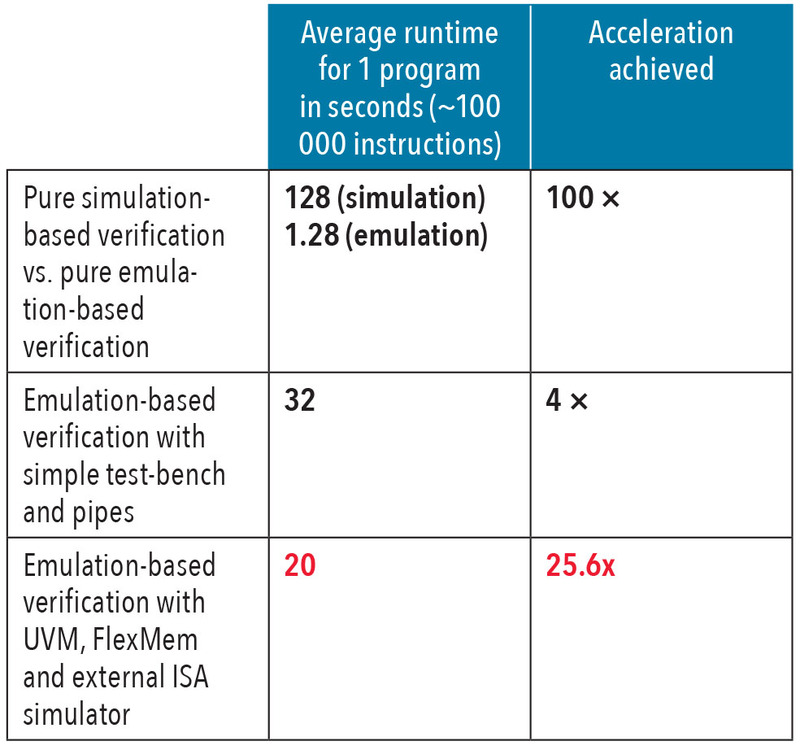 For example, we estimated that we can achieve at least 100 times verification acceleration when using the emulator. 2. As a second step, we recommend creating two top-levels: the emulator top-level module and the testbench top-level module. The emulator top-level module instantiates the Berkelium processor, and the testbench top-level module contains a simple SystemVerilog class with two pipes to start processing programs and detect the end (it also initiates comparison of the content of registers to the reference content, which is for now done by a simple diff, so no golden predictor model is used in this phase). This approach makes it possible to run more programs on the processor and detect first bottlenecks. For example, we found out that processing the programs is very fast, but loading new programs is ineffective and decreases the emulation performance 25 times. To eliminate this problem, we used FlexMem blocks later in the process, as described in the next section of this article. 3. Finally, it is recommended to connect all UVM objects you intend to use into the testbench top-level module, as they usually add some additional bottlenecks. We connected SystemVerilog programs loader, Codasip C++ ISA simulator as the reference model, one active UVM agent to drive processor’s input ports and read the decoded instructions (important for measuring instruction coverage and instruction sequences coverage), and passive UVM agents for reading the transactions on buses, content of architectural registers, and content of memory, as these are compared to the reference results originating from the reference model. The emulation performance decreased so much that we started with profiling in Questa® as well as in the emulator. The result was that FlexMem blocks are very effective for loading programs from software to the emulator, however, we had to implement so-called “transactors” [x] for driving processor’s input ports from the active UVM agent, for monitoring decoded instructions from the processor, and for detecting the end of the program. We also realized that having the golden predictor model and Scoreboard comparison as part of the software testbench is not effective, as moving the content of transactions, registers and memories between the emulation top-level and the testbench top-level negatively impacts the performance. Thus we decided to locate the predictor outside of the test-bench top-level and to leave it up to the emulation top-level to trigger the results comparison by the diff tool when the end of the program is detected. This means that the golden predictor model is running in parallel to the emulation, and we used dumping of DUV as well as reference data resources from both the golden predictor model and from the processor located in the emulator. For illustration of the result- ant environment, see Fig. 5, below. We achieved the results shown in Table 2, "Emulation Performance Results", by employing the three mentioned steps. The current version achieves 25.6x acceleration, but we are working on further optimizations including data aggregation on the testbench and on the emulation side, and measuring instruction coverage on the emulator directly. This article covered three topics that result from the flexibility of RISC-V IP cores. The first topic described usage of the configuration layer, and was divided into three sub-parts. The first part introduced the automation flow used in the processor development environment called Codasip Studio. This flow enables the user to simply input desired supported configuration, and the Studio automatically generates all the tools needed for verification and application development. The second part explained the usage of defines in RTL and UVM files. This part showed that the user can have multiple configurations implemented in one package of source files. This is possible thanks to compiler defines allowing to mark parts of the code that are specific to individual processor extensions. The third part elaborated on the procedure of using a UVM configuration database. The advantage of this approach is the integrated configuration in UVM itself. 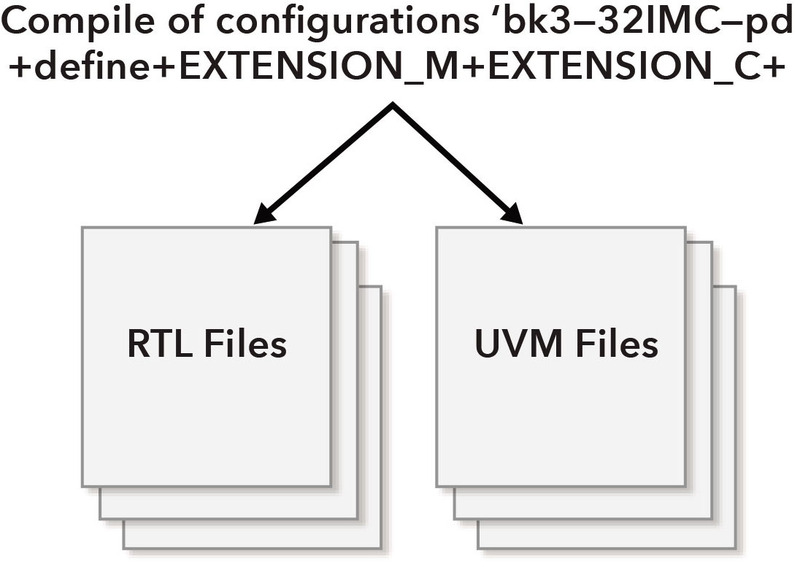 As it is restricted to UVM files, RTL needs to only include files for one configuration at a time. We transformed a pure simulation-based UVM environment into an emulation environment employing the best practices, and measured the acceleration results. In cooperation with Mentor, we identified parts of the processor that required specific treatment to exploit the full emulation performance. Excluding the predictor model from UVM, implementing transactors, and utilizing diff comparison outside the UVM allowed us to remove a significant part of the DPI layer and decrease the burden of data transfers between software and the emulation environment. Also, utilizing FlexMem approach when loading programs to the program memory proved to be less time-consuming than using pipes (readmemh and writememh functions) directly with emulator memory. David Patterson and John Hennessy. (2017) Computer Organization and Design, RISC-V Edition, Morgan Kaufmann. John Shen and Mikko Lipasti. (2013) Modern Processor Design, Waveland Press. Jari Nurmi. (2007) Processor Design, Springer. Marcela Zachariášová, Zdeněk Přikryl, et al. (2013) “Automated Functional Verification of ASIPs,” in IFIP Advances in Information and Communication Technology. Springer Verlag, pp. 128–138. Hans van der Schoot and Ahmed Yehia. (2015) “UVM and Emulation: How to Get Your Ultimate Testbench Acceleration Speed-up”, DVCon Europe 2015. Janick Bergeron, Alan Hunter, Andy Nightingale, Eduard Černý. (2006) Verification Methodology Manual for SystemVerilog. Springer. Note: This paper was originally presented at DVCon US 2018.